At Viral Booth, we love bringing wedding photo booth ideas to life with couples who want to immerse their guests in their theme. Our wedding photo booth rentals are all inclusive, but they are also extremely flexible. 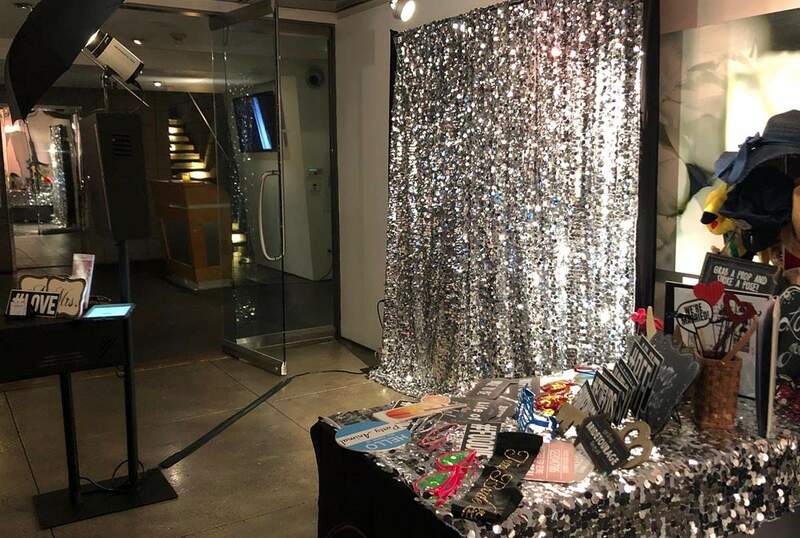 Brides and grooms can bring us their theme and we bring the photo booth to life. For Sienna and Nehi's wedding in Huntington Beach, CA, at the Huntington Bay Club, LVL Weddings & Events created a spectacular tropical experience. Photographed by Tyler Chase Photography, the Sienna and Nehi's ceremony took place right on the club's beach. Then, their reception was a party all night in the Huntington Bay Club with the DJ and photo booth. Key to the Huntington Beach photo booth experience was creating a photo layout that reflected Sienna and Nehi's tropical theme. Our Viral Booth graphic designer worked with Nehi to create the perfect, unique photo layout. 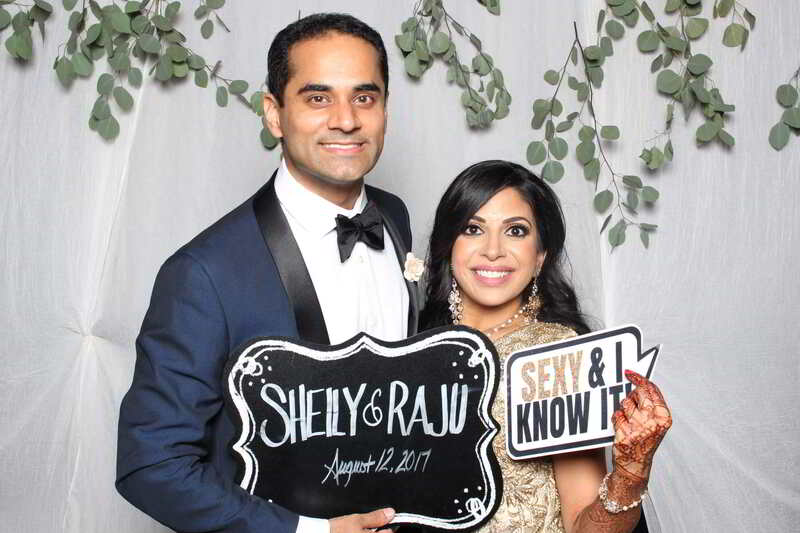 The one-shot, horizontal 4x6 creation featured an offset photo booth picture to make room for the couple's hashtag on the left side of the layout. Then, on the right side, we added a palm leaves watercolor graphic as an overlay on the photo booth pictures. Finally, the font was a special choice that reflected the laid-back, playful beach-vibe theme. Nehi was so pleased with his photo layout, and wedding booth experience, that he gave Viral Booth OC a 5-star Google review. There are so many options for wedding photo booth backdrops. From fabric to sequins, satin and printed patterns and scenes. Photo booth backdrops also come in a variety of sizes. The most popular is about 8 ft wide by 8 ft high. The 8 ft backdrop is the perfect size for most venues and even outdoor events and events in homes. The size easily fits into almost every room. It also gives lots of space for more than a dozen friends to pose for the photo booth camera. Sienna and Nehi chose Viral Booth's ivory rosette satin 8ft by 8ft photo booth backdrop for their Huntington Beach photo booth. This premium photo booth backdrop comes standard with the all-inclusive wedding photo booth package. The ivory rosette complemented the tropical theme and looked beautiful with Sienna's white and green photo layout. The ivory rosette also looks beautiful in wedding reception areas. It brings a white wedding feel to the celebration. Viral Booth also offers the rosette backdrop in the colors champagne, silver and blush. At every reception where there's a photo booth, wedding guests rush the prop table to try on lots of options for their fun photo booth poses. Viral Booth goes above and beyond for our couples' prop selection. Every week, we hand-select more than a dozen fun hats, over a dozen glasses, masks, stick props, fun wedding signs, wigs and more for each of our couples' weddings the upcoming weekend. We've created 90s themed props for a fun-green screen wedding photo booth, pastel-themed props to match a blush pink wedding and even gone prop-less for ultra-chic wedding celebrations. 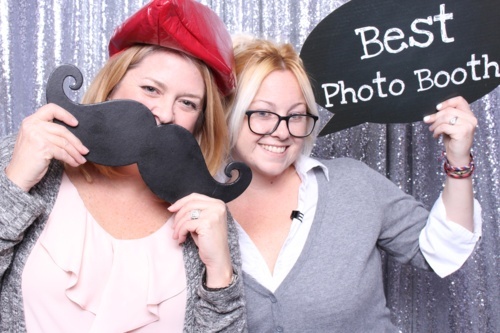 For Sienna and Nehi's wedding, their all-inclusive photo booth rental package included our fun-prop selection. Viral Booth fun props feature lots of hats from cowboy hats, fedoras and sun hats, to goofy green bug hats, red chili hats and turkeys. Added to the hats are glasses, signs and stick props. The wedding photo booth online gallery is the perfect way to enjoy all the pictures taken throughout the wedding reception. 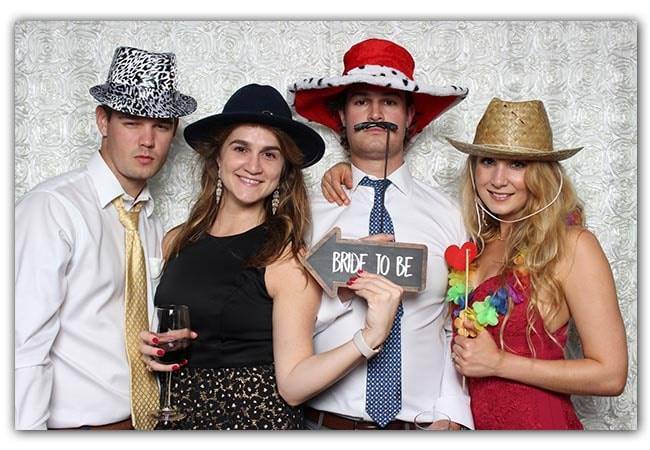 At Viral Booth, we email our couples a link to their photo booth gallery a few days after the wedding. 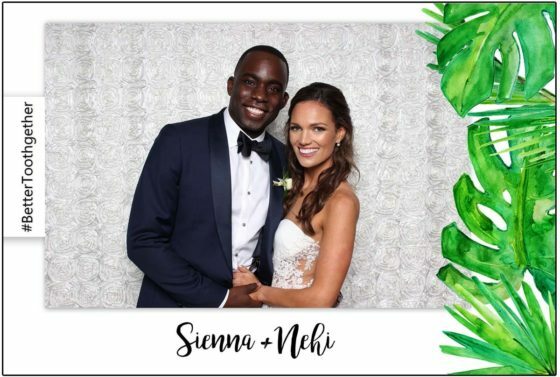 For Sienna and Nehi's Huntington Beach photo booth wedding gallery, we included all of their booth pictures that they could download and share with family and friends. 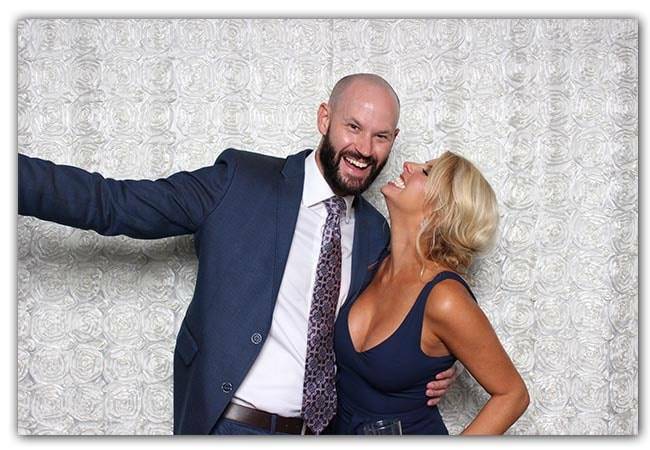 We love suggesting sending a link to the gallery to all wedding guests so that they can re-live all the fun in the photo booth. Plus, photos make great greeting card pictures and are even more fun to send to friends as pick-me-ups throughout the year. There are so many options for weddings in Huntington Beach, in addition to the spectacular Huntington Bay Club. Amazing waterfront venues include the Hyatt Regency Huntington Beach Resort and Spa, Waterfront Beach Resort, a Hilton Hotel and Pasea Hotel and Spa. Other terrific options further inland include The Red Horse Barn, Newland Barn, Old World Banquet Hall and The Venue by Three Petals. Viral Booth is proud to have provided wedding photo booths at all of these venues and so many more. For more information about a Viral Booth's wedding photo booth for your Huntington Beach wedding, or other Orange County venues, visit viralboothoc.com, call 949-391-6340 or email shanna@viralboothoc.com. 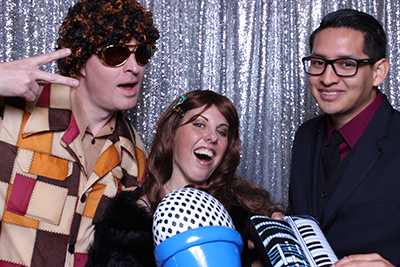 Corporate Photo Booth Rental – Stayin’ Alive!